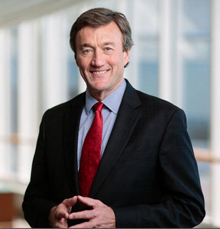 Today Betty Liu, Bloomberg news anchor, interviewed John Noseworthy, M.D., CEO at Mayo Clinic. Topics discussed included: 1) changes the nation's health care system must undertake; 2) creating more efficiencies in health care delivery; and 3) payment reform. Dr. Noseworthy explained how the Affordable Care Act focuses on providing health insurance coverage but does not address our fragmented health care system or how health care organizations can improve the quality and safety of patient care. Watch this video for the full interview.